I was looking through some old issues of Food Network magazine I bought at a garage sale recently and I found a version of this recipe for Tomato Cobbler. I was super intrigued by the idea of a savory tomato cobbler, so I played around with the recipe a bit, swapped thyme for basil (because I just love basil), used Bisquick to make a lightened up cobbler topping and added cheddar cheese to the biscuit dough because cheese. I thought this turned out really great and it’s a versatile side dish that pairs really well with meaty main courses like chicken or steak. Plus, it’s super easy to make and just 177 calories or 4 Weight Watchers SmartPoints for a big serving! Looking for more ideas for easy and delicious side dishes? Check out my Easy Garlic Knots, Cheddar Broccoli Orzo, Butternut Squash Quinoa Salad, Greek Orzo Pasta Salad, Cheesy Broccoli Bake, Garlic Roasted Green Beans with Almonds, Zucchini Casserole, Loaded Cauliflower Bake, Zucchini Squares, Cheesy Potluck Potatoes, Crispy Corn Fritters and many more in my side dish recipe category! Place 2 tablespoons of the butter in a large skillet over medium-high heat until melted. Add the onions and stir together. Cook for about 5 minutes until onions are softened and translucent. Add the garlic, a tablespoon of the basil and the cayenne pepper and stir together. Cook for an additional minute and then add the cubed large tomatoes, the brown sugar and the salt. Stir together until well combined. Wait until bubbling and then reduce heat to a simmer. Simmer for 4-5 minutes until tomatoes just begin to soften. Remove from heat and stir in the cherry tomatoes and the flour. Transfer the tomato mixture to a 2 QT baking dish. Cut the remaining tablespoon of butter into cubes and use them to dot the top of the tomatoes. In a mixing bowl, combine the Bisquick mix, dry mustard, black pepper, the remaining teaspoon of basil, milk and shredded cheddar and stir until a soft dough forms. 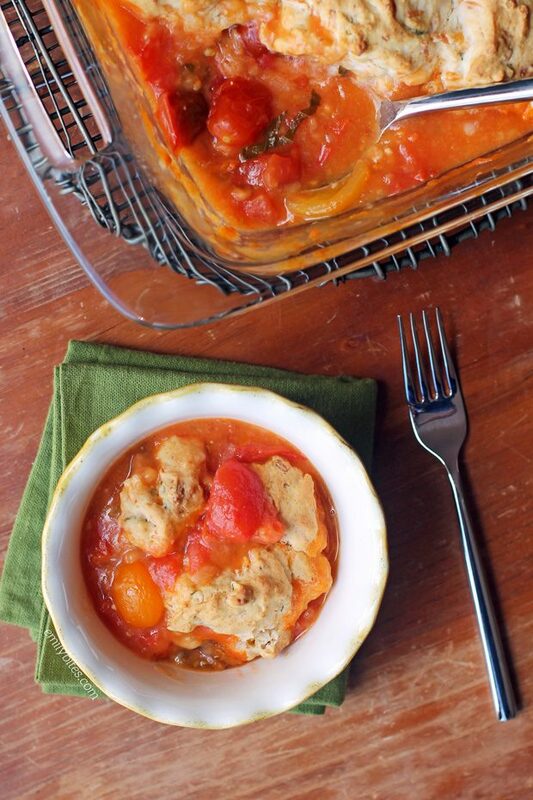 Use a spoon to drop pieces of the dough across the surface of the tomato mixture. 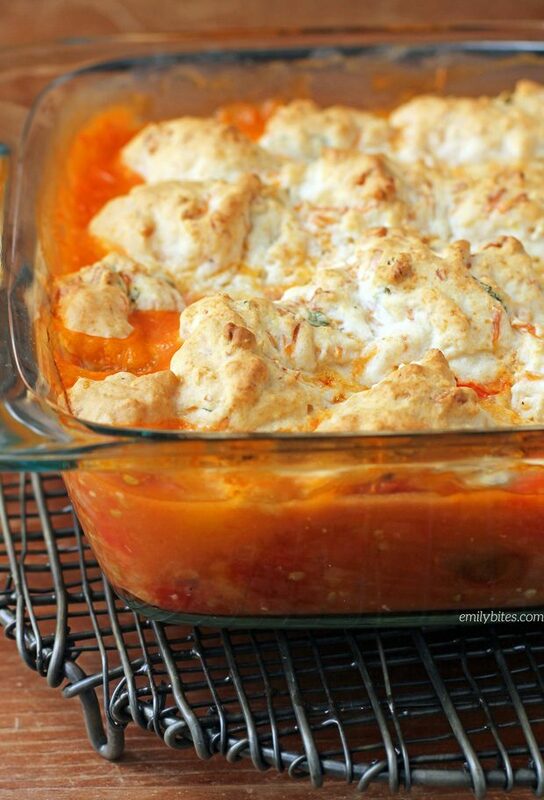 Place the dish in the oven on the middle rack and bake for 35-45 minutes until the tomatoes are bubbly and the biscuit topping is golden brown. Let the dish rest and cool for 15-20 minutes before serving. Made this tonight-it was great! I love your blog! It has revitalized my view of cooking weight watcher style!